Cannabis seedlings at the Aurora Cannabis facilty in Montreal on Nov. 24, 2017. Aurora Cannabis Inc.’s revenue surged as the company sold a record amount of cannabis in a quarter, but the pot producer’s selling price fell sharply as it entered the competitive recreational market. 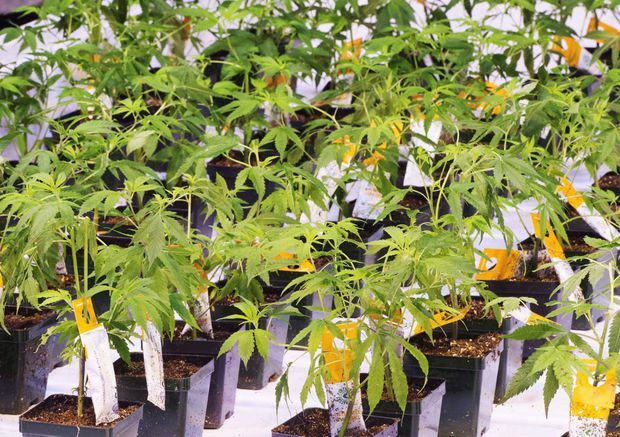 The Edmonton-based company’s quarterly financial results released Monday evening shed light on the pressure cannabis producers face as they seek to increase production and adjust to rising costs associated with new regulations. With much of the investor and analyst focus heading into Aurora’s Monday earnings call on the nascent recreational market, the company vowed to continue to prioritize its medical cannabis business – a segment that remained larger and more profitable for the company. “We are positioned to capture a larger part of medical market in Canada and abroad,” chief corporate officer Cam Battley said on the call. Aurora’s numbers for the period ended in December offered investors a first glimpse into the 2½ months since the legalization of recreational cannabis in mid-October. Aurora touted overall quarterly sales of $54.2-million, up 83 per cent from the prior quarter, $21-million of which came from in recreational sales. But the company’s average selling price of dried cannabis dropped by 26 per cent, the company said, and its gross margin on cannabis sales was at 54 per cent, down from 70 per cent the prior quarter, primarily owing to a lower average selling price per gram of dried cannabis, the mandatory tax that was added to medical marijuana in October and temporarily lower proportion of cannabis oil sales in the company’s revenue mix. The company’s loss for the quarter ballooned to $237.8-million. Aurora said it claimed roughly one-fifth of the new recreational market, which has been plagued by supply shortages. “We are ramping up production rapidly,” Mr. Battley said. During its second quarter, Aurora said it increased cannabis production by 57 per cent to 7,822 kilograms and raised the amount it sold by 162 per cent to 6,999 kg, as it “significantly” scaled up its cultivation operations. Legal recreational cannabis sales in Canada have been subdued by insufficient supplies despite strong demand, causing Ontario – the country’s biggest market – to limit its initial round of retail licence offerings to just 25 through a lottery process and Alberta to impose a pseudo-moratorium on licences in November. There are 75 licensed retail stores in Alberta, but some run out of supplies between weekly deliveries. Also on Monday, Aurora said it completed its first commercial cannabis oil export to a pharmacy in Britain, where specialist doctors can prescribe it. Last month, Aurora signed a deal to buy Whistler Medical Marijuana Corp. in an all-stock deal worth up to $175-million, giving it access to premium and organic-certified products from the privately held company that operates two indoor licensed production facilities. Editor’s note: An earlier version of this story said Aurora’s loss for the quarter ballooned to $237.8-billion. In fact, it reached $237.8-million.